While I really enjoyed this book, it wasn't what I was expecting. I was expecting something a lot more enthralling, captivating and fast moving. But what I got was something more gradual, slow and magical. Which was still okay but I would have hoped for it to be a bit better paced and more linear. The writing style was amazing. It was told in the third person for the most part with small second person chapters scattered throughout. This made you, the reader, a part of the story. An example of what I mean is the excerpt above from Book Depository. It used many words I didn't know, which I had to look up. This made me slow down in my reading even more and make me disconnect slightly from the story as I was reading. But that wasn't necessarily a bad thing. It had a lot of sensual descriptions. It felt like I was in the circus throughout the entire book. Though, the people weren't very well described but I liked that--I could discern for myself what they looked like. One person that was well described was Poppet but the rest were left more the imagination. The story was told in the late 1800s and early 1900s. The problem I had with this was that it jumped back and forth between years and character POV's (each chapter is from a different person's POV). It made it a little difficult to discern what had already happened and what had not happened when it went back and forward in time. If you concentrate enough it shouldn't be much of a problem. It was an interesting way to write the story. Though, if this becomes a movie I'm not sure how this will work. The characters were (for the most part) developed well. I really enjoyed the chapters with Baily, Poppet and Widget. I feel they were the characters I connected with most. Most importantly, their friendship was believable! I found Celia and Marco (the main characters) to be a bit flat and dull. I didn't relate to them and the romance didn't come into it till over halfway through the book. It was all too sudden and I found it forced and unbelievable. I really didn't enjoy them and I feel like we were supposed to since they were the main the characters. There was various circus acts (not typical acts) which I really liked. The descriptions of the circus acts and the acts seemed very magical. There are acts such as tarot card readers, contortionists and illusionists.The circus itself was described beautifully and I felt as if I was there! The sensual writing really helps that. Overall I enjoyed this book a lot and would recommend it to anyone who loves magic and illusions and romance. I really want to read this book. 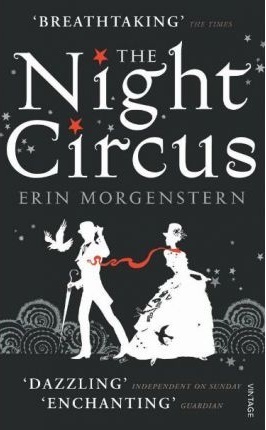 After reading Water for Elephants I'm captivated by the circus life somewhat. Thanks for sharing, I found you on book blogs. Water for Elephants is an amazing book but that books is more the typical circus, this is very different! This book is on my shelf since this winter and thanks to your review I will start it soon! That's great, I hope you enjoy it.